RunCore, leading supplier of high-performance solid-state drives, announces the global launch of their Xapear Solid State Disc drive. RunCore’s Xapear is a smart USB 2.0 connected SSD solution with RFID protection, allowing you to split your data into a freely accessible partition, and a hidden partition that only becomes accessible by applying a special RFID key to your SSD. Furthermore, the Xapear offers remote data destruction by simply sending an SMS over your GSM from your mobile device to the integrated GSM receiver, which then will immediately start overwriting all your data and thereby deleting all previous content. After successful data elimination the SSD’s GSM will send a confirmation SMS to your mobile. The Xapear comes with two RFID keys, that will be initialized by the users themselves. After this initialization users can use a “public” and a “hidden” partition and define their respective sizes. In regular use the “hidden” partition cannot be detected by others, only once the RFID key is being swiped over the Xapear SSD itself will the “hidden” partition appear. After another swipe this partition will disappear again. With this device data protection is entering an entirely new stage of security, which is particularly important in an ever more mobile environment where sensitive data and information are frequently being carried along, making it a potential risk to being used by unauthorized 3rd parties. 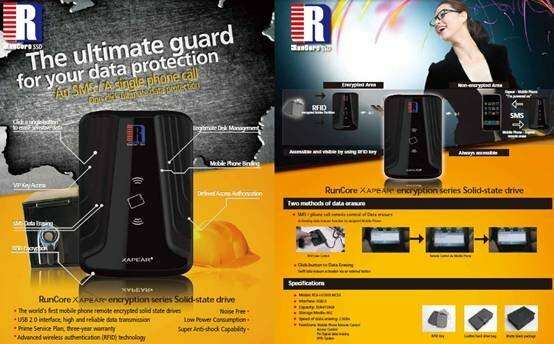 With the RunCore Xapear you now have a highly advanced data protection solution for most demanding professional usage which is also suited for the private sector where data security is becoming an ever more important concern.